The first gold medals on offer at the 2016 ITTF World Tour Hybiome Austrian Open have gone to Sakura Mori and Park Ganghyeon, after the two players picked up the respective Under 21 Women's and Men's Singles titles in Linz on November 12th. Japan's Mori defied the odds to overcome the top seed Doo Hoi Kem (9-11, 11-6, 9-11, 13-11, 11-7) in the Under 21 Women's final, while Park received his first Under 21 Men's Singles trophy with his fourth game victory over Enzo Angles (12-10, 11-6, 6-11, 11-8). Sakura Mori’s success in Linz sees the Japanese player win her third Under 21 gold medal on the ITTF World Tour having achieved her previous titles at the 2014 Belarus and Japan Opens, but arguably her performance at the 2016 Austrian Open against Hong Kong’s Doo Hoi Kem was one of her finest showings on the table to date. Leading up to the match both Doo Hoi Kem and Sakura Mori had to negotiate difficult semi-final clashes; Mori saw off fellow compatriot Mizuki Morizono in four ends while Doo’s triumph over Thailand’s Khetkhuan went right down to the wire before going to the Hong Kong player in the deciding game. Doo Hoi Kem made the quicker start out of the blocks out of the two finalists, putting a 0-1 game lead on the scoreboard but Sakura Mori made a quick response and her 11-6 win in game two brought the tie level. The previous encounter between Doo and Mori was played at the 2016 SheSays China Open which ended in the Hong Kong player’s favour, however, despite going 1-2 ahead in the final of the Austrian Open it was Mori who prevailed. The 20-year-old from Japan, Mori took back-to-back games to bring the tie to a close (9-11, 11-6, 9-11, 13-11, 11-7) and subsequently secure the title. While it may have been title number three for Sakura Mori, it was a first Under 21 gold for Korea Republic’s Park Ganghyeon following his 3-1 win against France’s Enzo Angles. 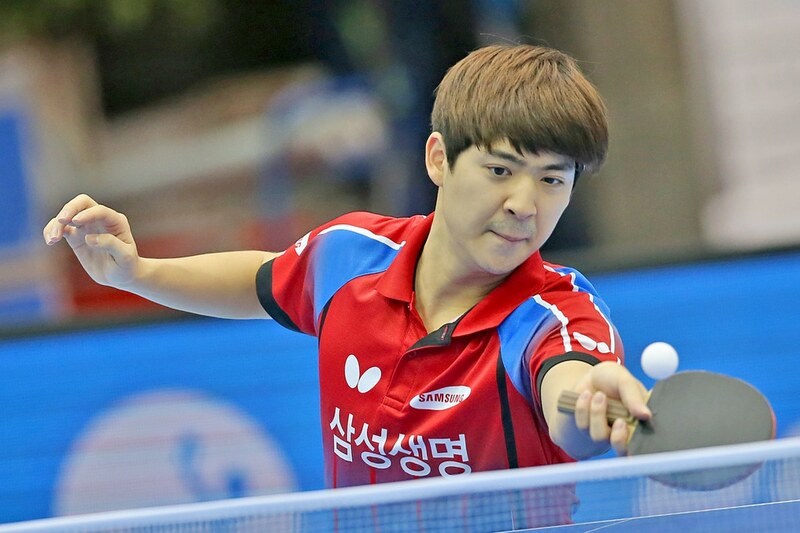 Prior to the 2016 Hybiome Austrian Open, Park’s previous best finish on the World Tour was a silver medal won in the Under 21 category of the 2016 Belarus Open in early September where he lost out to Cho Seungmin in the final. But Park wouldn’t be disappointed in Linz after he successfully moved to the top step of the winners podium. Enzo Angles was expected to be a tricky opponent for Park with the Frenchman having caught headlines in the earlier stages of the competition after he knocked out the No.1 seed Tomokazu Harimoto and No.14 seed Kirill Gerassimenko, but Park was playing with a confident manner right from the get-go in the final and after edging out the opening game in deuce the Korean player managed to move 2-0 in front. The momentum was with Park who required just a single game to seal the win, and despite all of Angles’s efforts the Frenchman couldn’t mount a comeback attempt and by the conclusion of the fourth game the outcome had been settled with Park emerging from the final with a gold medal to his name (12-10, 11-6, 6-11, 11-8).